Shelf Life, which is about a family’s generation gap, is based on hundreds of interviews with youth and seniors in Toronto’s Weston-Mt. Dennis neighbourhood. Can a play bridge a generation gap? A new production called Shelf Life is certainly trying. 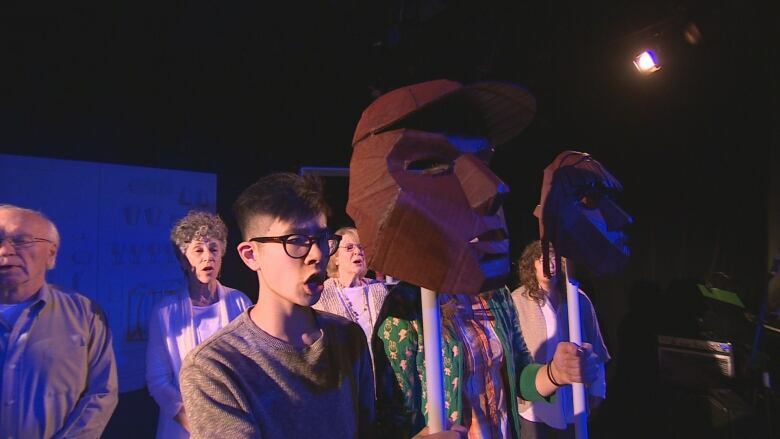 The production, which is about a family's intergenerational conflict, is based on hundreds of interviews with youth and seniors in Toronto's Weston-Mt. Dennis neighbourhood. The play was designed to foster understanding between teenagers and older Torontonians. Over the course of almost two years, Mixed Company Theatre held 28 workshops and talked to more than 120 people about the generational stereotypes and problems they face. "Both the youth, the adults and the seniors all want respect," said director Simon Malbogat. He said a lot of seniors discussed feeling overqualified for jobs when they retired, while youth talked about feeling underqualified for everything. Malgobot said there was a great response to the workshops, in which they did exercises and improvizations with community members to try to work through some of their issues. The workshops took place with the Lambton House senior group and the youth organization, Urban Arts. Playwright Luciano Iogna wrote the script for Shelf Life, which is about the tensions between the teenagers, parents and grandmother in one Toronto family. "What we have is a playwright that's a good listener." But the community involvement doesn't stop at show time. In the second act of the play, audience members can come onstage and act out solutions to the problems they saw in the first half. Malgobot said this method, called "forum theatre," helps inspire people to make social change. In their first few performances, he said, audience members were eager to get involved. "It's always astonishing to me how responsive audiences are to it. Especially at this play, they're completely into it," said actor Nance Gibson, who plays the grandmother in Shelf Life. "I think generally theatre is one of the best ways of communicating ideas. People can relate so much because they see what's going on." Mixed Company Theatre has been producing forum theatre productions since 1983. The company's mandate is to make "innovative, socially relevant drama as a tool for positive change." Shelf Life finishes its run at Tarragon Theatre with an afternoon show on Dec. 4.